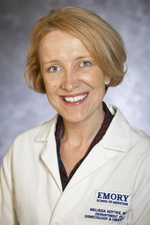 Melissa Kottke, MD, MPH, MBA is Director of the Jane Fonda Center at Emory, a position she has held since 2007. She is also an associate professor in the Department of Gynecology and Obstetrics at Emory University School of Medicine and Medical Director of Grady Teen Services at Grady Memorial Hospital. Dr. Kottke is originally from the Midwest. She received her medical degree from the University of Minnesota Medical School of Medicine and completed her ob/gyn residency at the University of Texas Southwestern School of Medicine. She then completed her fellowship in Family Planning at Emory University School of Medicine. Additionally, she received her Masters in Public Health at the Rolllins School of Public Health at Emory University and her Masters of Business Administration at Goizueta Business School at Emory University. Dr. Kottke is a member of the American College of Obstetricians and Gynecologists, the Association of Reproductive Health Professionals, the Society of Family Planning, the North American Society of Pediatric and Adolescent Gynecology, the Society of Adolescent Health and Medicine, the Atlanta Ob/Gyn Society, the Georgia Ob/Gyn Society, and Physicians for Reproductive Health. She serves on committees at the national, regional, and institutional level. Dr. Kottke lectures widely on issues related to family planning and teens’ reproductive health. As Medical Director of the Teen Services Clinic at Grady Health System, Dr. Kottke is responsible for the day-to-day operation and oversight of the service including the development and implementation of management guidelines and protocols for the care of teen patients for their Family Planning needs, monitoring quality, and administration of the teaching program for medical students, residents, faculty, and staff in adolescent sexual and reproductive health. To view a list of Dr. Kottke’s research publications, please visit this link. To view Dr. Kottke's academic bio, please visit this link.